What a difference a day makes to the weather in South London. Saturday was gloriously sunny, shirt sleeves and beautifully outdoorsy. Sunday was wet, windy and far cooler a real autumn day. The match was at Chelsea’s Kingsmeadow ground, near Kingston-upon-Thames, just about an hour and a half from home – ten minutes walk, then three trains and a 15 minute walk to the ground. There was the kind of fine drizzle in the wind, you know the kind where if you aren’t properly wrapped up you are soaked to the skin before you realise you are wet. Not a great afternoon to be sat down and certainly not a good day to be running about playing football. Nevertheless there were 2019 other hardy souls in the ground when the official attendance figure was given with a small but noisy away supporter group being led by the irrepressable Maria. Before kickoff Chelsea made a presentation of a framed shirt to Drew Spence to mark her 150th appearance for Chelsea this drew warm applause from all supporters. The first fifteen minutes were relatively even, with no good clear cut chances for either team, Pauline Peyraud-Magnin made one routine catch from a shot by Kirby but it was never going to result in a goal, there was one blocked shot at each end, there were a couple of Chelsea fouls and one Arsenal corner that came to nothing. The second 15 minutes started with more intense Chelsea pressure, two blocked shots and a corner that resulted in a missed header. Arsenal then started to exert pressure of their ownfirstly winning a corner and recycling the ball to the left hand side of the Chelsea area where Little was undeniably fouled by Engman – it wasn’t a bad foul, but was quite clear. Sam Purkiss, the referee, had no choice but to point to the spot. Kim placed the ball herself and dispatched the spot kick to the top left hand corner giving Telford no chance. Our away fans immediately started the one nil to the Arsenal chant. This was the first goal that Chelsea had conceded in the WSL this season. The rest of the second 15 minute period was back to half chances at both ends but the score remained at 1 – 0. The final 15 minute segment of the first half brought a Chelsea free kick in a dangerous area which Ji So-Yun took. It was to Pauline Peyraud-Magnin’s left but she was easily equal to it. In minute 38 we went into a two goal lead; Beth Mead did well to hold the ball as we cleared it upfield, she fed Kim Little who provided an assist for Vivianne Miedema to show once again why she is about the best in the game – an excellent finish to the bottom left corner (albeit with a slight deflection) again giving Telford no chance. Further chances came at both ends, but Arsenal looked to be fully in control of the game and our chances were better and more numerous. Half time and we were comfortably on top and with a two goal lead. Could a major upset be on the cards? Chelsea were undefeated as they strolled to win the WSL last year, they hadn’t been beaten at home in over two years and had completely destroyed Arsenal last time we played in the FA Cup Final last May when frankly we were outclassed. The second half started with neither manager making any changes. The first chance went to Chelsea but again it was a routine save for our keeper. We won a couple of free kicks and Andersson had a shot that went harmlessly over the bar. Miedema got the ball on the right hand side and played a through ball down the touchline for Jordan Nobbs who hit it and somehow it flew high into the left corner of the net. Was it a cross that caught the wind or was it a Jordan Special? I guess that she will be the only one with the true answer. All I know is that it was something special and we were not 3 – 0 in the lead with just seven minutes of the second half played. Chelsea made their first substitute with Cuthbert replacing Engman. Five minutes later and we were in full attacking mode again. Miedema fed Mead a delicious through ball but her shot was saved by Telford but straight into the path of Miedema. Only one place the ball was going then, and it duly went into the back of the net for 4 – 0. Chelsea made a second substitution with Riley coming on for Andersson. So we started the final 15 minutes in total ascendancy and I think that the situation got to some of the Chelsea players. In Minute 62 Drew Spence made an awful challenge on Kim Little, late, from behind and round both of Beth’s legs. In all her 150 starts for Chelsea I doubt that Drew has ever made a worse challenge. Even the Chelsea fan next to me agreed with me that it was a red card, every day of the week for any referee. Not in Mr Purkiss’s eyes though, as he brandished a yellow. Kim was immediately helped off the pitch and replaced by Katie McCabe. She left the pitch on crutches at the end of the 90 minutes. Spence went on to finish the match. Minute 67 Nobbs got her second of the match and our fifth. 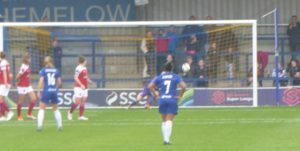 She was fed a through ball by Beth Mead (who had worked tirelessly all afternoon despite being on the end of some very uncompromising treatment from a variety of Chelsea players) and Jordan made no mistake from the right hand side of the area finding the bottom right corner of the net. After that we basically played very professionally and gave Chelsea no real chance of getting a consolation goal. We had to be awake at all times as Chelsea players were putting in sliding challenges from 10 meters in their eagerness to get the ball and on more than one occasion we had to leap out of the way to avoid being scythed down. So at full time a momentous win by Arsenal to beat the current Champions. Five goals on their pitch where they were unbeaten in over two years and they hadn’t conceded a goal in the WSL this season either home or away. A good day to be a Gooner and all of you who weren’t there missed a great game of football. Our WSL record this year – P4, W4, Goals For 21, Goals against 3. That’s 33 goals scored in 6 matches and 4 conceded. In the WSL Vivianne Miedema is top scorer with six. She has 14 shots of which a stunning 86% (12/14) have been on target. Her strike rate is 60 minutes per goal. She also has four assists. Who in the Arsenal team has committed the most fouls this season? You will not guess!!! I watched on TV – the standard of the women’s game is excellent and generally played in a good spirit. Club’s philosophies appear to follow into the women’s game with our side trying to play quick passing football and Chelsea trying to “impose” themselves. Spence, clearly talented, was a thug all game and that resulted in another Arsenal player getting injured by a tackle from behind. The commentary was almost as bad as the men’s game. Arsenal – despite having a history in the game that will probably never be emulated – were written off. Chelsea and Man City lauded to the heavens, while Arsenal were in terminal decline – the fact that the Chelsea and Man City got there by spending fortunes gutting our all-conquering team in the process, was ignored. Arsenal’s role in raising the profile of the women’s game, through taking it seriously before the other major clubs did, never acknowledged. And the contrast in the the managers’ interviews afterwards spoke volumes to the relative class of the clubs. 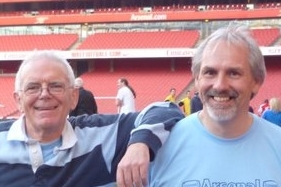 I really hope our ladies / women / girls shove it down everyone’s throat, but I suspect referees will intervene as they do in the en’s game – and, as I seem to recall, was reportedly the case against Man City when we suffered some serious unpunished assaults? In some interview yesterday, Jordan Nobbs said it was meant to be a cross. “Arsenal – despite having a history in the game that will probably never be emulated – were written off. Well said. Simple and concise. People can dissect it as much as they want, but the big picture is that that is exactly what happened. 2 teams who had been basically rubbish for years, won the lottery and spent 100’s of Millions, nay BILLIONs on players, often at our expense and we were still better than Liverpool and Spurs. It’s as simple and straight forward as that. Nice interview on Arsenal.com about Vivianne Miedema. She has lots of interesting little stories. Played a game against a boys team that her team won 7-5, she scored all 7 goals. Her first team debut, she comes on as a sub with 20 minutes remaining down 0-1. She scores twice to win game. Anyway, lots of other things there. Nitram, just to be clear, I was talking about the dismantling of Arsenal Ladies, as was, by the big money of Chelsea and City – but a similar story with the men. Air-brushed out – Arsenal Women aren’t contenders, like the men, because they don’t spend the f… ing money – forget that there would be no money inbthe women’s game without Arsenal’s contribution for all those years. Arsenal.com has the news out, fractured fibula. Kim Little is out for up to 10 weeks. That Chel$ea player should be banned for 10 weeks. Oh, and ban the referee for 10 weeks as well. The referee (Sam Purkiss) seems to get many more games as a linesman than a referee. It would appear this was the first WSL game he had this year. Hopefully the last.